AlphaNinja: Talbots sells J.Jill, locks in a huge loss. AlphaNinja - My goodness. About the only thing worse than Talbot's (TLB) operating performance has been its "trading." 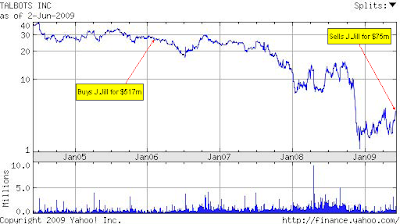 They purchased J.Jill for $517m back in 2006, and are now unloading it to SF-based Golden Gate Capital for $75m, in a reversal of the "buy low, sell high" strategy. This was the 2006 era, when consumer cyclicals were dangerous to short, as private equity was running around buying them for 8-10 times EBITDA (earnings before interest, taxes, depreciation & amortization). “Talbots paid approximately 19.3 times earnings before EBITDA [earnings before interest, taxes, depreciation, and amortization],” says Solomon of Goldsmith Agio Helms. “That is a huge multiple for a business with some concerning negative trends, such as declining same-store sales. Let's assume that they only achieve 50% of the synergies, which would be $12 million, then the implied post-synergy EBITDA would be $35 million, and the multiple would be 12.7 times EBITDA.” That's still aggressive and far higher than Talbots' 6.4 times trading multiple. “If you give them 100% credit for all the projected synergies, you're still at 9.3 times EBITDA,” Solomon says. Another "ouch" is the valuation - Talbots paid about 1.1 times sales when it purchased J.Jill, and is selling it for approximately .16 times sales - cheers to Golden Gate Capital, the buyer in this transaction. Sarcasm and snide comments by AlphaNinja aside, Talbots' stock is certainly not baking in a lot of good news at these levels, and the upside is likely FAR more than the downside.